Notification Date If your proposal is accepted your department will be notified within one month of the receipt of your application and a grant agreement package will be provided to you for signatures. You will be required to return the completed grant package within 30 days. To provide unprotected rural volunteer fire companies with cost-share funding opportunities to purchase firefighting equipment, supplies, personal protective equipment and training in order to support wildland firefighting in their respective communities. USDA Forest Service- through the National Fire Plan. The total amount of funding available for Volunteer Fire Assistance grants is $145,000. N.J.S.A. 13:1D-9 (q), (r ) and N.J.S.A. 13:9 et seq. A single fire department serving a rural area or a rural community with a population of 10,000 or less is eligible (using the latest Census data). Area fire departments (fire districts, townships, etc.) may serve an aggregate population of greater than 10,000 as long as the service area of the fire department includes a rural area or a rural community having a population of 10,000 or less. The VFA funding must be used to benefit the rural population. A single county or town with a population over 10,000 which is served by two or more fire districts operating entirely within the bounds of the county or town may qualify as long as the service area of a given fire department includes a rural area or a rural community or the population of the fire department's jurisdiction is 10,000 or less. The VFA funding must be used for the rural area. A single community with a population greater than 10,000 and having a single fire department with one or more fire stations may qualify. The fire department must have a service area that includes a rural area or community that does not exceed a population of 10,000. The VFA funding must be used only for the benefit of the rural population. Similarly, a single community with a population greater than 10,000 that also provides fire protection by contract to an adjoining rural community of 10,000 or less in population may also be eligible provided the VFA funding is used entirely to support the rural community. The minimum amount an eligible fire department or community may request is $3,000. A maximum of $10,000 may be requested. Funding depends on the number of requests and the funds available. If an application/proposal is accepted for a grant award, 50% of the total project amount will be reimbursed. Fire Departments may apply for funding of multiple projects or purchases. The applicant’s matching contribution must be from sources other than federal grants. All purchases must be made within the specified time period to be eligible. No awards will be permitted for any single piece of equipment with a cost of $5,000 or more. VFA funding is not authorized for purchase, construction or renovation of capital improvements such as fire stations or pressurized water systems. 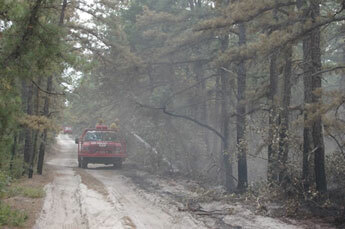 Prospective applicants must submit a complete application which can be obtained at www.njwildfire.org. A comprehensive description of the projects and/or equipment to be considered is required.